UPDATE: In retrospect I should have chosen a more careful title. Paige Brown Jarreau performed a survey among science bloggers. 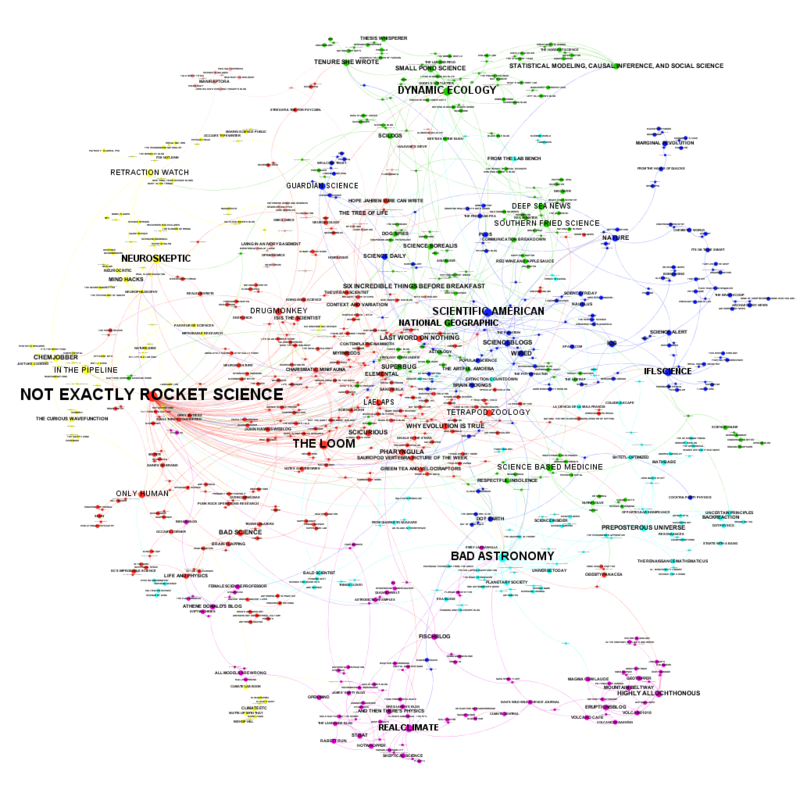 A first result is the fascinating network analysis of science blogs shown above. She also published a PDF where you can zoom in to look at the details. The survey asked every blogger to list three other regularly read science blogs. In the figure above the blogs are the dots and every mention is a link between the dots. The more incoming links, the bigger the dot and name. The links do not show in which direction the link runs. The smallest print is for blogs that participated, but have no incoming links. Clearly dominating is the blog Not Exactly Rocket Science by Ed Young. Also influential is Bad Astronomy by Phil Plait, who also blogs about climate and the "climate debate". Except for these two outliers, the network is surprisingly egalitarian. There is likely a sampling bias, but the small number of non-english blogs is striking. For us the climatic part of the blog universe is naturally most interesting. Here RealClimate clearly dominates. Even if they are not that active anymore and are calling for a new generation of climate scientists to help them continue high-quality climate science blogging. One should be very careful to interpret the details. My little blog is only more visible than the blog of the more important International Surface Temperature Initiative because I have one incoming link. Such details can thus quickly change when more bloggers had participated or more than 3 blogs could have been mentioned. Emphasized by the automatic coloring scheme is the splendid yellow isolation of WUWT & Co. If there would be no link between WUWT and the Climate Lab Book, they would have no link to science whatsoever. This network analysis could be used to determine who is eligible for a bloggie in the category science. Here it should probably be mentioned that a link is not necessarily a recommendation. I know of some US climate scientists that keep an eye on WUWT to know of the latest nonsense story before the journalists start calling. You can be sure that they do not read WUWT to learn about the climate system. The isolation was to be expected given the quality standards at WUWT, which do not fit to science. More activist blogs, such as Georg Monbiot and Desmog Blog are not in the climate cluster, but can be found on the middle right as a green cluster. [UPDATE 2: There are now several blog posts on this topic. Stoat (William M. Connolley) and Climate Etc. (Judith Curry) summarize this post. The comment section at CE is, again, very ugly, full of personal attacks, which is the response of last resort if you do not have any arguments. Fitting to the isolation of the WUWT & Co cluster is that the Stoat post gives me more visitors than the post at Climate Etc. While for a Climate Etc. reader it would make more sense to expect that my post is misrepresented and thus to click on the link to check what was really written. And just like WUWT, Climate Etc. is proud of the large amount of comments and clicks; Judith Curry in 2010: "If what I said was utter nonsense, why is anyone here talking about it, I have 440 comments in 24 hours." If CE is really so big, it certainly has more comments, you would expect more, not less, readers coming from there. Lucia at The Blackboard reports about the Climate Etc. post with the funny title: HotWhopper’s Sou Doesn’t read WUWT! A smart observation. Lucia is highly intelligent and a fierce debater. The climate "debate" would be more interesting if she would run WUWT. Unfortunately, she seems to see the climate "debate" as a sport. If she were more interested in improved understanding, I would read her blog often. The blog I probably visit most frequently I didn't list - because I don't rate it as a science blog, although I see that it appears on your map. And Then There's Physics: A great place for intelligent conversation on climate and the climate debate. HotWhopper: A good place to keep up to date with what happens at WUWT without having to read the misinformation. Sometimes you do not remember where you got some information from, you might think it was a reliable source, whereas it was WUWT. I already embarrassed myself among colleagues by repeating something I had learned at WUWT and could not imagine being wrong, being so basic, but it was. Best to limit your exposure, to keep your brain healthy. Real Climate: If there is a new RealClimate post that is likely to be a good investment of my precious life time and I read a large part of them to keep up to date with the state of the art in fields where I do not work on myself. Lucia also wondered why I did not mention WUWT. I do not know anymore. Maybe because the question was about science blogs and WUWT is a political blog. The reaction of WUWT to a new piece of research can be predicted extremely well by considering whether it makes the political case for mitigation stronger or weaker. On a science blog, the reaction would depend on the quality of the research and whether the conclusions are justified by the evidence presented. Maybe I also just did not mention WUWT because reading it is not a high priority. But I have never denied reading WUWT occasionally. When I read it, more out of interest as blogger. It is the voice of mainstream mitigation skepticism. It is probably not a good idea to interpret single links and sizes of blogs. You should probably not even interpret the size of the clusters due inherent problems with sampling and because blogs in the cluster of WUWT & Co might not have seen themselves as the target group. It is still interesting that the only link between the WUWT & Co. cluster to the rest is Ed Hawkins stating to read WUWT. None of the sampled blogs in the yellow cluster have reported themselves to read blogs outside of their cluster. The "isolation" is, in this respect, self-selected. In this regard, it is somewhat strong that mitigation skeptics complain about me showing this network. If the sample were bigger, some links may have appeared. And there might be weaker links; had the question asked for a larger list of blogs, these links may have appeared, but the cluster would likely have stayed quite self-referential. I would expect that that part of the network analysis is robust and that is why I emphasized that part. A Network of Blogs, Read by Science Bloggers. Here Paige Brown Jarreau (The Lab Bench) explains more details of the network analysis and shows a plot with all the blogs in the purple climate/geo science cluster. The figures can be found at Figshare. You can play with this data via an interactive Gephi graphic here: bit.ly/MySciBlogREAD, which also gives you links to the blogs to find new interesting ones. The BBC will continue fake debates on climate science. Interesting what the interesting Judith Curry finds interesting. There are a number of scientific meetings coming up for people interested in the homogenisation of climate station data. The International Symposium CLIMATE-ES 2015 (Progress on climate change detection and projections over Spain since the findings of the IPCC AR5 Report.) will be held in Tortosa, Tarragona, Spain, on 11-13 March 2015 and is organised by Manola Brunet et al. Deadline for abstract submission and registration is in four days: 15 December 2014. There is a session on Climatic observations and instrumental reconstructions: the development of high-quality climate time-series, gridded products and data assimilation techniques. Chaired by José Antonio Guijarro. Three sessions at the general assembly of the European Geophysical Union (EGU) are interesting for us. Climate Data Homogenization and Climate Trend and Variability Assessment by Xiaolan Wang et al. ... This session calls for contributions that are related to bias correction and homogenization of climate data, including bias correction and validation of various climate data from satellite observations and from GCM and RCM simulations, as well as quality control/assurance of observations of various variables in the Earth system. It also calls for contributions that use high quality, homogeneous climate data to assess climate trends and variability and to analyze climate extremes, including the use of bias-corrected GCM or RCM simulations in statistical downscaling. This session will include studies that inter-compare different techniques and/or propose new techniques/algorithms for bias-correction and homogenization of climate data, for assessing climate trends and variability and analysis of climate extremes (including all aspects of time series analysis), as well as studies that explore the applicability of techniques/algorithms to data of different temporal resolutions (annual, monthly, daily¦) and of different climate elements (temperature, precipitation, pressure, wind, etc) from different observing network characteristics/densities, including various satellite observing systems. Bridging the gap between observations, reconstructions and simulations for the early instrumental period by Oliver Bothe et. al. We invite submissions addressing climate variability of the early instrumental period, especially on works combining or contrasting different sources of information to highlight or overcome differences in our estimates about the climate of this period. Contributions aiming at exploring the role of the external forcing in climate variations during the period of interest are specially acknowledged. This includes new estimates about climate variability and forcing in this period. Furthermore, we welcome more general submissions about the long term imprints of episodes with strong natural forcing comparable to that in the early instrumental period. Taking the temperature of the Earth: Temperature Variability and Change across all Domains of Earth's Surface by Stephan Matthiesen et al. The overarching motivation for this session is the need for better understanding of in-situ measurements and satellite observations to quantify surface temperature (ST). The term "surface temperature" encompasses several distinct temperatures that differently characterize even a single place and time on Earth’s surface, as well as encompassing different domains of Earth’s surface (surface air, sea, land, lakes and ice). Different surface temperatures play inter-connected yet distinct roles in the Earth’s surface system, and are observed with different complementary techniques. The deadline for receipt of abstracts is 7 January 2015, and abstracts can be submitted through the session website. Just a pre-announcement, the next Data Management Workshop will be in St. Gallen, Switzerland on 28th-30th October 2015. Save the date in your agenda. Further announcements will follow later by Ingeborg Auer. Even further into the future, is the 13th International Meeting on Statistical Climatology in 2016 (IMSC2016), Vancouver, Canada. I guess the date itself is not fixed yet. Previous IMSC's were very interesting. The still empty page to bookmark. Did I miss any upcoming meetings or other news? Please add them in the comments.